This project is one part of the National BioResource Projects (NBRP) in Japan for more than 20 species including animals, plants, microbes, tissues and DNAs. It is founded by the Japanese Ministry of Education, Culture, Sports, Science and Technology (Monkasho) and started in 2002. The major purpose of this project is to collect, preserve, and provide bioresources (such as experimental animals and plants) that are essential experimental materials for life sciences research. The project also aims to improve the bioresources by increasing the value of bioresources through enriching genome information and developing fundamental technologies for preservation and other necessary procedures. The Institute of Laboratory Animals, Graduate School of Medicine, Kyoto University, is the central facility for the species rat. 1.Collection, preservation and provision of rat strain information. 2.Improving bioresources by increasing the value of bioresources through enriching genome information. 3.Measuring parameters for functional characterization of deposited rat strains. 4.Quality assurance through microbial and genetic monitoring conducted with all strains. 5.Coordination of research using deposited rat strains. 6.Overseas promotion of cryopreservation and assisted reproductive technologies. 7.Exchanging information around the rat in annual Rat Resource and Research Meeting. NBRP-Rat contributes as the world’s largest rat repository to various fields of biomedical research. A catalogue of comparable, standardized and well characterized rat strains will lead to new and more precise research topics as well as it will facilitate biomedical sciences, drug discovery and advanced chemical research not only in Japan but worldwide. Japan has been promoting science and technology (S&T) for 15 years under three successive Science and Technology Basic Plans. The 4th Basic Plan also provides for the “integrated development of science, technology, and innovation (STI) policy”. In furthering the relationship of S&T to society, it is necessary to carry out STI policy, as part of policies for society and the public good, with the broad participation of citizens, gaining their understanding and trust. Kyoto University, with Osaka University, was selected as one of the sites for the human resource development of “SciREX: Science for RE-designing Science, Technology and Innovation Policy” by the Ministry of Education, Culture, Sports, Science, and Technology. The program aims to promote international-level research and human resource development at the graduate schools selected as the Hub Institutions for educating experts of evidence-based policy making as well as researchers who shall deepen and expand the emerging research field of “science of STI policy”. In February 2012, a unit for “Program for Education and Research on science and Technology in Public Sphere” was set up in the Center for the Promotion of Interdisciplinary Education and Research in Kyoto University. 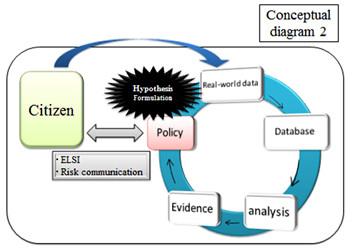 To establish science and technology innovation policies, it is necessary to develop evidence based policymaking not only by evidences based “quantifiable data” including the methodology of technology assessment but also process of public engagement in science and technology with deliberation “intensive debate” by various stakeholders including citizens. Our educational program from 2013 establishes a minor specialization as a part of existing master’s programs with the aim of developing 2 types of human resource; “link” between different academic disciplines, and “link” among academics, policy and society with a focus on ethical, legal and social issues (ELSI) in science and technology. 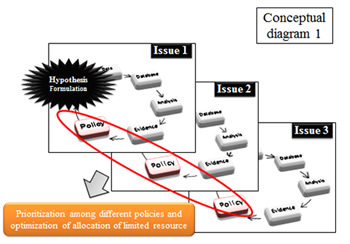 Conceptual diagram of the decision-making from the various regions With regard to the research for focusing on ELSI in science and technology, graduate students will engage in important theme such as prioritization among different policy issues and optimization of allocation of limited resource. With regard to the research for developing evidence-based innovation policy, visualization is one of the essential methodology for solve the social issues. Graduate students will also focus to the circulation of the collecting real-world data, creating database, analyzing including technology assessment, creating evidences, generating policies, and formulating hypothesis. These methods are also considered useful of various fields including energy, environment, agriculture, food products, engineering, and space science. In order to achieve our missions, we assume that there is an urgent need to foster personnel who are capable enough to think beyond their own specialized fields, and to meet science and technology and social challenges from comprehensive and diversified perspectives. We also address to develop human resources with knowledge, sense and practical capacity to conduct activities and research on public engagement and possible career paths on completion of the program expect various research positions; government jobs; position as a policy secretary: think tank employee; university research strategist; and risk communication staff; and more.